OK, Android phone owners...this App is for YOU! It is with great pride that I announce the launch of the Rain Station App for Android. 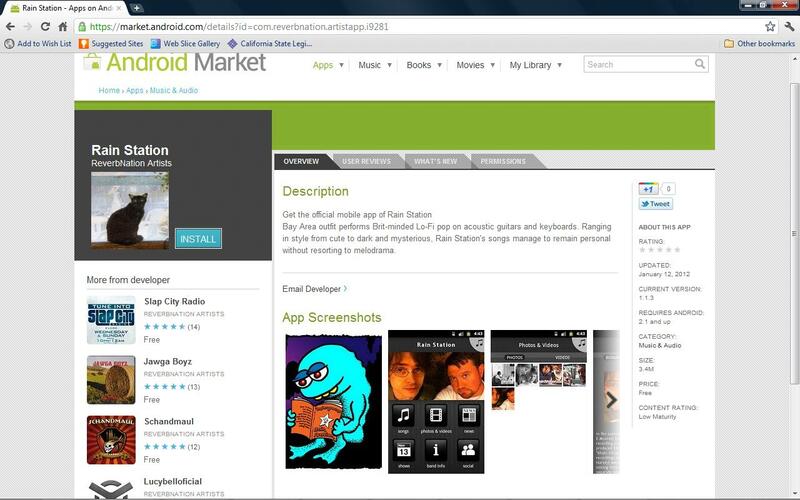 Now both our Apple and Android phone fans can enjoy Rain Station wherever they go and the best part is the App is FREE. Go get yourself some Rain Station here (for Android) and here (for Apple). 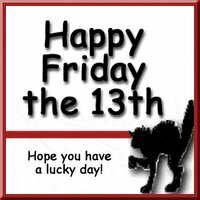 Is Friday the 13th unlucky? I've never thought so. Then again, 13 is my favorite number and I am no Paraskevidekatriaphobic. I read this article as well as heard a lot on my drive into work about the number 12 and how perfect it is and how 13 must be imperfect if 12 is. People at work yesterday kept telling me..."Well, tomorrow is YOUR day!" to that I replied..."What, you mean Friday? Halloween is MY day!". I guess everyone thinks it is cute...the boss is a spooky guy...likes Halloween and 13. And who doesn't like Fridays? Some time ago I found this interesting "info" on the number 13. 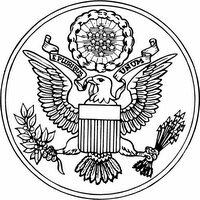 In The Great Seal of the United States, which can be found on the back of the dollar bill, the number 13 is used 13 times. The Bald Eagle was selected as a symbol for victory for two reasons: first, he is not afraid of a storm; he is strong and he is smart enough to soar above it. Secondly, he wears no material crown. We had just broken from the King of England. Also, notice the shield is unsupported. This country can now stand on its own. At the top of that shield you have a white bar signifying congress, a unifying factor. We were coming together as one nation. In the Eagle's beak you will read, "E PLURIBUS UNUM," meaning "one nation from many people." Above the Eagle you have thirteen stars representing the thirteen original colonies, and any clouds of misunderstanding rolling away (13 clouds around the stars). Again, we were coming together as one. Notice what the Eagle holds in his talons. He holds an olive branch and arrows. This country wants peace, but we will never be afraid to fight to preserve peace. The Eagle always wants to face the olive branch, but in time of war, his gaze turns toward the arrows. They say that the number 13 is an unlucky number. This is almost a worldwide belief. You will usually never see a room numbered 13, or any hotels or motels with a 13th floor. But, think about this:13 original colonies, 13 signers of the Declaration of Independence, 13 stripes on our flag, 13 steps on the Pyramid, 13 letters in the Latin word "Annuit Coeptus" above, 13 letters in "E Pluribus Unum", 13 stars above the Eagle, 13 clouds around the stars, 13 plumes of feathers on each span of the Eagle's wing, 13 bars on that shield, 13 leaves on the olive branch, 13 olives on the branch, and if you look closely, 13 arrows. And the number of letters (13 x 3) in the title: "The Coat of Arms of the United States of America". On Miles Davis's 13th birthday, his parents gave him a trumpet. Thirteen is the death card in the Tarot deck. The Friday the 13th club used to meet religiously in obscure places each and every Friday the 13th. The club was to self destruct in accordance with the wishes of it founder on last Friday the 13th in October of 2000. The club was founded in 1936. Many hotels and apartment buildings do not have a 13th Floor. People don't like to travel on any given Friday the 13th, and tickets are always easy to get. 13 Bloody Sunday. On January 30, 1972 (Bloody Sunday), 13 unarmed civilians were shot and killed in Belfast when British troops clashed with Roman Catholic demonstrators, causing retaliatory actions by guerrillas in Northern Ireland and demonstrations south of the border. According to the American Mathematical Monthly, the 13th is more likely to fall on a Friday than on any other day. In ancient times, Friday the 13th was a sacred and festive day celebrated by women before it was invalidated and condemned by the ancient patriarchy. Thirteen was the number of lunar revolutions in a year, thus a feminine number. And Friday, derived its name from Freyja, the Norse goddess of love and fertility, the Nordic Venus. Thus Friday the 13th was devoted to that goddess. Napoleon, Herbert Hoover, and Franklin D. Roosevelt all would not dine with 13 at the table. O.J. Simpson and the number 13. O.J. Simpson and Nicole Simpson were officially divorced on July 13, 1993. Nicole Simpson and Ronald Goldman each had 13 letters in their names. Their dead bodies were discovered in Brentwood on June 13, 1995. The British Medical Journal released a study evaluating the number of hospitalizations on Friday the 13th. It found that falls, animal bites, poisonings, and car accidents were more numerous on that date. And the journal found it impossible to say whether the day itself was unlucky or that the psychological weight attached tot hat date made people more susceptible to those accidents. Negative prophecies, after all, are always goads for dire consequences. Many believe that 12 is the perfect number. It is often symbolizes totality, perfection, a completion: the twelve signs of the zodiac, the twelve gods of Olympus, the twelve tribes of Israel, the twelve Imams, the twelve Gates of Heaven, the twelve months of the year, the twelve hours of the day, the twelve-tone musical scale, the twelve subatomic building blocks quarks and leptons now believed to constitute all the material world. Into these systems, the number 13 brings a kind of instability, an element of intrusiveness, confusion, un-canniness and disorder. In the Mo system of Tibetan divination, the number 13 is said to belong to Penden Lhomo, the Tibetan form of the Buddhist goddess Sri Devil, the fierce protectress of the Dalai Lama and the Tibetan state. In this system of divination, three dice are thrown, which can result in numbers from 3 to 18. The number 12 is the unluckiest, the number 13 is the most favorable. There are said to be 13 stages to Buddha hood consisting of ten bodhisattva stages and three additional pre-Buddhist stages. "M" is the thirteenth letter of the alphabet and it also stands for marijuana. The 13 House. In 1884, Sarah Winchester, the Winchester Rifle heiress, began constructing of her lifelong obsession, the 160-room Winchester Mystery House in San Jose, California. Mrs. Winchester, who had lived in New Haven, Connecticut, was deeply upset by the death of her husband and daughter (he from pulmonary tuberculosis, she from marasmus one month after birth), and she consulted a medium. Supposedly the medium explained that the spirits of all those who had been killed by the rifles her manufactured had sought their revenge by taking the lives of her loved ones. Furthermore, these spirits had placed a curse on her and would haunt her forever. But the medium also stated that she could escape the curse by moving west, buying a house, and continually building on it as the spirits directed. In this way, she could escape them and perhaps find the key to eternal life. 13 cement blocks in the Carriage Entrance Hall. 13 Blue and amber stones in the spider web window. 13 windows in the 13th bathroom. 13 windows and doors in the old sewing room. 13 hooks in the SÃ©ance Room. 13 Ever-Flow drain holes in the Italian Sink. 13 rails by the spy hole in the South Conservatory. 13 steps on the 1st flight to the fourth floor. 13 ceiling panels in the Entrance Hallway. 13 sub-panels in the ballroom ceiling panels. 13 glass cupolas in the greenhouse. 13 holes in the drain-hole cover. 13 stones in the Oriental Bedroom windows. 13 squares on each side of the Otis Electric Elevator. On April 13, 1984, the Winchester Mystery House officially celebrated on hundreds years of Mystery, with the help of the Mountain Charlie Chapter No. 1850 of E Campus Vitus, by unveiling a special 100th Anniversary Plaque commemorating Sarah Winchester and the Winchester Mystery House for "100 years of Mystery". At 1300 hours (1:00 P.M.), the bell in Mrs.. Winchester's bell tower was rung 13 times; and at the conclusion of the celebration, 1,300 balloons were released into the air. There are 13 parts to Sarah Winchester's will; her signature appears in it 13 times. Between June 1962 and January 1964, Albert H. DeSalvo, known as the Boston Strangler, killed 13 women in Boston, Massachusetts. Tried and convicted in 1967, he was murdered in his jail cell. On September 13, 1993, Yasir Arafat and Yitzhak Rabin shook hands on the White House lawn in Washington D.C., after signing a declaration of agreement on interim Palestinian self-rule. Odysseus, the 13th of his group of companions, is the only one to have escaped the devouring appetite of the Cyclops Polyphemus. The Amazon Queen Minythyla tried to mate with Alexander the Great during a period of 13 days. Oenomaus, the father of Hippodamia, killed 13 of her suitors before Pelops won her. Phillip II of Macedonia was assassinated shortly after he allowed a statue of himself to be erected along with those of the 12 gods of Olympus, making 13 statues in all. Thirteen is to be considered the age of puberty, and the first transition into "teen-hood". That 13 brings ill-luck is mere tradition,Yea, even more, it's foolish superstition-For 13, lucky number runs,Through all our Country's ripening suns-Tis for Our Land and omen good-For Peace-Liberty-Brotherhood! The 13 American colonies banded together to revolt against England and formed the United States Of America. The Declaration of Independence was signed by 13 representatives, and a flag with the 13 stars was made on January13, 1794. France announced support for the 13 colonies on June 13, 1778. The 13th Amendment to the U.S. Constitution, which declares, "Neither slavery nor involuntary servitude shall exist within the United States." Mississippi was the last of the nine Civil War holdout-states to approve the amendment. The ill-fated Apollo 13 mission was launched on April 11, 1970, at 13:13 hours Central Time from Pad 39 (13 x 3), and had to be aborted on April 13 after the explosion of an oxygen tank serving the command ship. Three of the sleeping periods scheduled for the astronauts were supposed to start at 13 minutes past the hour, as was the possible splashdown times. The film Apollo 13 grossed $26 million (13 x 2) in its first weekend showings in the United States. When Princess Margaret was born in Scotland's Glamis Castle on August 21, 1930, palace officials delayed the registration of her birth for three days until another baby was born, so that the princess' registration number wouldn't be 13. When Queen Elizabeth II paid a visit to West Germany in 1965, the number of the platform at they Duisburg railway station, from which she was about to depart, was changed from 13 to 12A. The French monarch Louis XIII, who declared the number 13 to be his favorite number, married Anna of Austria when she was 13 years old. The number 13 bus in London remained unharmed throughout World War II. So how's about that all you #13 lovers!? !